CERTAIN, or the Comparative Effectiveness Registry to Study Therapies for Arthritis and Inflammatory Conditions, is designed as a prospective nested substudy under our larger RA registry. CERTAIN uses the existing CORRONA network of participating private and academic sites in order to recruit RA patients who have at least moderate disease activity. 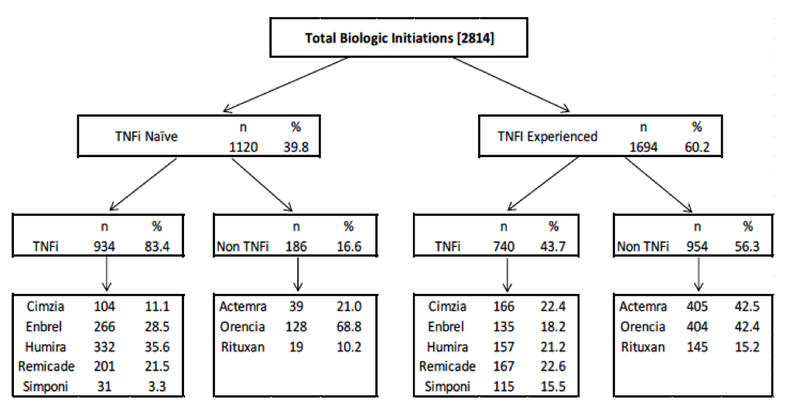 Patients starting or switching biologic or small molecule DMARD agents were eligible for enrollment and were treated with either an anti-TNF agent or a non TNF biologic, depending on the treatment selected by their physician. These categories of treatment were enrolled in a ratio of 3:2. The CERTAIN substudy includes 2,814 patients across 43 sites, with 117 rheumatologists. All 2814 patients have a “true baseline” before drug start at which time an array of biosamples was collected including DNA, RNA, plasma and serum. These samples were also collected at 3 and 6 months, along with physician and patient outcome measures q3months through 12 months. The CERTAIN study biosamples are a unique and valuable resource for companies looking to study biomarkers, genomics, genetics and their relation with deep prospective clinical outcomes.